Chau Doc in the Mekong Delta is a charming destination with a fascinating mix of Khmer, Vietnamese, Chinese and Cham communities. An Giang province is often one of the worst affected regions when floods hit the Mekong Delta, which is why unlike other provinces in the Mekong Delta, rice-exporting is not the most important trade here. The main driving force in the province’s economy is catfish farming, a fish which contributes to around a fifth of Vietnam’s total seafood output. The highest concentration of “floating houses” with fish cages can be observed on the western banks of the Chau Doc River near where it meets the mighty Mekong. Nguyen Van De, a local resident from the floating village, takes us on his boat for a quick tour around Chau Doc River. On the tranquil river, we cruise past neat rows of houses, which all have fishing cages underneath them. There are nearly 2,000 floating houses in the village. Some of the more sturdy houses are made with bricks and wooden frames and covered by fibre grass tiles. However, a few more flimsy looking constructions are made out of bamboo and coconut leaves. We clamber off the boat onto the wooden deck of a house. A piece of wood has been left open so you can peer down into the fish cage where a large school of fish jumps up and down. Much to our surprise, the residents seem to have all the mod cons and assets families would have on land: We can see satellite dishes, televisions and motorcycles while all residents seem to own a mobile phone. De can raise about five tonnes of cat fish in eight months. 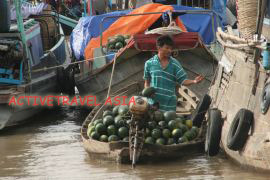 His children can easily get to school after a short boat trip to Chau Doc town too. Life here seems good. Past the floating village, we find Con Tien (Fairy Island) where a community of around 3,000 Cham people live. According to relics at Mubarak Mosque, the Cham community set up their settlement on the island in 1691. Just like any other popular spots for tourists, right at the entrance to the Cham village is a souvenir shop selling Cham silk handbags and scarves! We check out a store owned by a woman called Ysa, who is a surprisingly laid back seller. According to Ysa weaving was one of the prerequisite skills for a well educated girl in Cham society. She has been weaving since she was only 15 and set up the store back in 1998. All of her products are handmade with traditional weaving equipment. She employs 20 women from the village and claims she earns a stable income. According to Ysa, traditionally, while the women weaved and took care of domestic chores, Cham men sailed down the river to trade. Thanks to a common religion and shared customs Cham traders had plenty of success trading with Malays. A colourful culture Chau Doc town is a swirling mix of ethnicity and religion. With Khmer, Vietnamese, Chinese and Cham communities, you will find institutions dedicated to Confucianism, Mahayana Buddhism, Theravada Buddhism and even Sunni Islam as well as churches for Christians and followers of Cao Dai and Hoa Hao religions. One of the most famous religious buildings is Ba Chua Xu Temple on Sam Mountain. Two hundred years ago, Sam Mountain was said to be covered with a forest and full of wild animals. Only pirates and bandits dared to go there. One day, a group of Siamese men came across a beautiful red stone statue on the summit of the mountain. Although the statue was small, none of them could lift it up. The men quickly grew frustrated and in a blind rage, they smashed the statue and departed. But in a nearby village, on the same day a girl went into a strange fit — her face was flushed red and her head shook violently. She started to speak and called herself Chua Xu Thanh Mau (the Holy Mother of the Region). She commanded villagers to climb the mountain and fetch her statue back to the village. The villagers found the statue on the top of Sam Mountain but they could not move it either. They returned and asked for the little girl’s advice. She told them to send nine maiden girls up the mountain to carry the statue down. Sure enough the nine girls were able to lift the statue up and carry down the mountain. But at the foot of the mountain, the statue suddenly grew too heavy for the nine girls too carry so they laid it down. The village elders guessed that was the place that the Holy Mother wanted to be placed and consulted an oracle. A shrine was duly built on the site on the 25th day of the fourth lunar month and ever since on that day pilgrims have come to Ba Chua Xu temple. Besides Ba Chua Xu Temple, Tan An Pagoda, which was constructed in 1847 by Doan On, is also worth a visit. The three-storey pagoda with the onion-shaped turret designed in the Muslim–Indian architectural style is on the side of Sam Mountain. On the top of the pagoda sits a striking white statue of the Supreme Buddha. From outside the pagoda is not that eye catching but the statues and carvings inside are wonderfully vivid and life-like.